Hamer is a European thermoforming mold manufacturer that designs and manufactures equipment for the packaging industry, specifically for thermoforming machines that produce single-use plastic packaging, as well as automatic and semi-automatic lines for the production of blister packs. Founded in 1980, Hamer applies their knowledge to conceive and design the tooling, but they can also import designs to their system of CAD files supplied by the client. 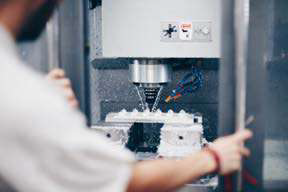 With several CNC Machining centers, the company works with materials such as aluminum, steel, or technical polymers to manufacture molds. Hamer manages critical aspects such as refrigeration and vacuum circuits that help to properly control the molding process. Hamer completes the final assembly and finishing of the molds by hand in their own facilities to guarantee a superior finish. Hamer is able to offer solutions perfectly tailored to the needs of their clients because they control every part of the manufacturing process, from design to set-up. Their technical team is responsible for the design, and they control every stage of production in their own facilities. Once production is complete, they also carry out the commissioning and initial operation of the equipment. A blister pack is a type of packaging in thermoformed clear plastic that is mostly used in the marketing of small consumer products. Using the blister pack is relatively cheap and permits the stored product to be viewed, providing an additional opportunity for a quality check. Thermoforming is a process of transforming plain plastic foil into a three-dimensional shape through the application of heat, vacuum pressure, and air pressure. It is an inexpensive method that allows for the production of single-use plastic parts with a wide variety of uses, such as the packaging of a product or auxiliary carrying supports such as trays used in industrial production. 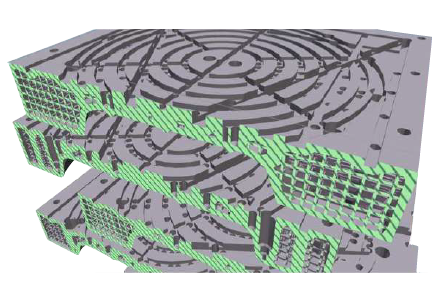 Thanks to the design freedom, topological optimization can be used to reduce the material. This design approach results in only printing material where it is actually needed. As plastic has a lower density than metal, a dramatic weight reduction is achieved. With HP Multi Jet Fusion, it is possible to print nine parts in only 16 hours. Machining these nine parts would take at least 45 hours (taking into account five machining hours per mold). This part was used to thermoform plastic bins. The material used previously was PVC 600 um. This mold will be used for prototyping. There is no need for high heat extraction. The design will allow for the self-removal of the air trapped during the thermoforming process without the need of vacuuming holes.